Captain T are a New York based band that plays... well, I guess they're a metal band for the most part. But ambivalence ran rampant in my mind as I listened to these two discs, both of which are slightly under the 30 minute mark. I'd better start with what would have been the end of my review so I don't lose you. The last track on the 1999 demo is a 17 minute jam called "Interplanetary Disgrace". The tune starts off sounding like they're going to cover "Set The Controls For The Heart Of The Sun". Metallic, but trippy. It then launches into several minutes of standard metal before shifting gears again and alternating between metallic psych jams and more of the spacey explorations that started the tune. In fact, some of this is pretty good, if not particularly mindblowing. They definitely stretch out over the course of the track's 17 minute length and I didn't feel like they lost their sense of direction. Ok... now I'll start from the beginning. The band's U.S. Aliens album starts with a gloriously horrific cover of "We Are The World". It's cool hearing this soppy song get trashed and the band is clearly having a good time doing just that, but it's pretty hard to take for more than a couple listens. "Aqua Blue" seems totally out of place being a doo-wop kind of tune and includes flute and sax. 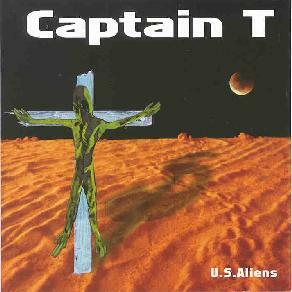 More along the lines of what Captain T seem to be about are "America's Free", "Disturbing Abduction", and "Banner (The Incredible Hulk)", all mostly standard metal tunes that show vague promise when we hear brief, but cool sounding stoner psych guitar. And the vocals remind me of metal hair bands like Poison or Motley Crue. "Banner" really tries hard to make me like it. The verses include whining romantic metal vocals and piano, though there's the briefest of moments when it looks like it's going to turn into a killer space metal tune á la Monster Magnet, but the band backs off just as soon as it begins. Strange. Besides "Interplanetary Disgrace", the 1999 disc includes "Manifest Destiny" and "Dishonest". The former is much like "America's Free". Just a hint of stoner rock, but it unfortunately restrains itself. "Dishonest" is more standard metal, but with a slight Red Hot Chile Peppers feel. I'm not sure what to make of Captain T. They've got possibilities that's for sure. But I sense a crisis of goals in which they're struggling to decide whether they want their MTV, or want to flex the creative muscles they appear to have and trip off into the glory of the cosmos. If they choose the later I hope I'm contacted. For more information you can visit The Captain T Band at their web site. Via snail mail at The Captain T Band, 780 Riverside Drive, Suite #9FF, New York, NY 10032.